Barista technique breaks down into three time scales and skill levels: The first is the minute or so spent grinding and making the shot. The key here is acquiring the skills to make shots consistently. One should be able to turn out four or five in a row with virtually the same timing, volume, color, crema and taste. This skill is a physical thing, that is, it's a matter of training and practice rather than learning. The second is the time spent carefully tasting an espresso or series of espressos, identifying the flavor balance and defects, and making adjustments to ones pull or machines to correct them. The "dialing-in" process for a new blend usually requires a series of shots to get a satisfactory result, and can proceed over several days to fine tune it. To do this well, one needs to have experience in tasting and analyzing good espresso. 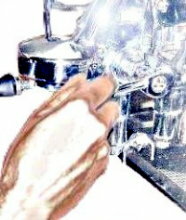 One also needs to know how changes in extraction variables and machine settings affect the espresso's taste. The third is acquiring experience and informed preferences with a wide range of coffees, blends, espresso equipment, and alternative techniques. If you or someone you're serving wants an espresso with a specific pallette of flavors; you will know how to provide it. Home roasting and blending helps in this. So does visiting good cafés and roasteries, and talking with the knowledgeable people there. Most people in North American drink their espresso in a latte or cappuccino. Until about ten years ago, there wasn't much to preparing these. But in recent years, the techniques of microfoaming and pouring latte art have become widespread, vastly improving the quality of these beverages. Latte art should be a part of every home barista's repertoire; an introduction to its technique is given later in the guide. Readying an idle machine for shot making. Grind, dose, level, and tamp. Espresso comes in two sizes: single and double. A single is a 0.6 to 1 ounce espresso made from 6 to 10 grams of coffee; a double is a 1.2 to 2 ounce espresso made from 12 to 20 grams of coffee. Singles and doubles take the same amount of time to pull, roughly 25 to 33 seconds, and the coffee flavors and aroma should be the same. However, I recommend that you start by making doubles. While the flavor of singles and doubles is the same, the crema on singles will always be less than on doubles. The mechanism underlying this is explained in the diagnostics section. Good crema improves mouthfeel and ameliorates harsh flavors, so doubles are more forgiving than singles. Good singles require perfect technique and very long practice; producing good doubles is easier. When first using a new grinder or when changing coffee blend, the grinder needs a large adjustment to be set correctly. On a new grinder, grind briefly and pinch the grind between your fingers; if it's in the correct range, it should feel very slightly granular, just short of a powder. Many grinders display a range or setting for espresso; if yours does, start there. When changing blend, just start with the current setting. Time the shot, and run it into a cup from which you can tell the volume. Stop the shot when the flow lightens to "blonde," a tan color showing some transparency. This flow color indicates that the proper amount of coffee has extracted, about 20% of the puck. Try to get into the middle of the acceptable range: 1.5 to 1.75 ounces in 25 to 30 seconds. If the shot takes longer, or delivers less volume, grind coarser; if it delivers more volume or happens in less time, grind finer. More precise adjustment requires tasting shots and diagnosing them. This is explained in the next section. If on a stepped grinder, no grind setting gets you within this range, start grinding on the setting that was closest but too fine, and halfway through, switch to the setting that was closest but too coarse. Then consider buying a better grinder. Almost all running but idle machines will have some component at the wrong temperature, so that a shot pulled from them without further ado will taste wrong. A machine that is turned off and cold will need to be turned on and left to sit for fifteen minutes to an hour to get it up to temperature, depending on the machine's size. At that point, it will have the same characteristics as an idle machine, and will also need to be prepared for its first shot. A boiler/heat shedding group machine like most spring levers may need a "blank shot" to warm it slightly. Running one dose of hot water through the group will do. Heat exchangers are designed to heat the water to the correct espresso temperature as it flows through them. Typically they are adjusted to do this at a normal shot making pace, that is, one espresso every minute to two. If the water sits in them longer, it overheats and has to be flushed out. If the group has a tendency to get cold, a blank shot of the right amount (typically 1 to 2 ounces) will cool the heat exchanger and heat the group to the correct shot making level. If the group has a tendency to run hot, a larger amount needs to be flushed so that the fast flowing water cools both the heat exchanger and the group. In this case the required amount is typically 4 to 8 ounces. The correct procedure varies by machine model. In brew boilers controlled by mechanical thermostats, the water can be well below the thermostat's turn-off temperature. On these (typically home machines), water should be run until the heater turns on. On some machines, you should time the heating cycle and pull the shot after the heating element has run the same amount of time in each case. On others, one should wait for the heat to turn off, and pull the shot immediately. In brew boilers controlled by electronic thermostats, the boiler water will be at the correct temperature. In some cases, however, the group will be at the wrong temperature, usually cold. In this instance, simple flushing doesn't work well, since one can overdraw the brew boiler and cool it off. One procedure, devised by David Schomer of Café Vivace, is to leave the spent puck from the previous shot in the group. Flushing through it will slow the flow sufficiently to warm the group without overdrawing on the brew boiler. It pays to speak to other owners of your model of espresso machine to get the exact procedures that machine requires (or if your machine was reviewed on Home-Barista.com, read the Pulling Shots by the Numbers section of its buyer's guide). Alternatively, you can mount a thermocouple in a brew basket or on the showerscreen, measure the water temperature, and devise your own procedures. I would recommend purchasing a thermocouple and reader for this purpose. They are quite inexpensive— a small fraction of the machines cost —and will certainly help to get the most out of it.